A little Pterosaur lives on top of a rocky mountain, where his mother teaches him to be kind and to always help others in need. One day, a huge Tyrannosaurus falls down the mountain and is injured as he tries to catch the little Pterosaur. Remembering his mother's lesson, the little Pterosaur decides to take care of the injured Tyrannosaurus. As a result of his fall, the Tyrannosaurus temporarily loses his sight, and asks, "Who is there?" The Pterosaur hides and answers, "I am a Tyrannosaurus." 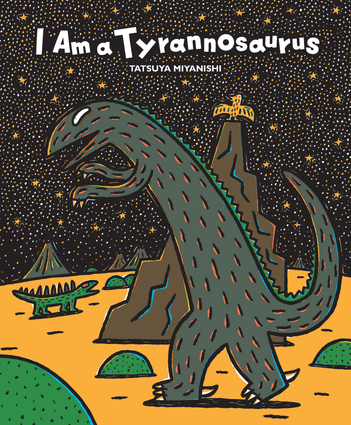 The fifth title in this acclaimed Tyrannosaurus series, I Am a Tyrannosaurus, delivers a heartwarming story about being kind and helping others with vivid, brightly colored illustrations and endearingly drawn characters. Tatsuya Miyanishi was a doll artist and graphic designer before becoming a picture book author. He has won the Kodansha Cultural Award for Picture Books, as well as the Kenbuchi Picture Book Grand Prize. Miyanishi's books have passionate fans of all ages that enjoy his range of endearing characters in many genres, from superheroes to dinosaurs, all illustrated with bright colors.